…I realized it was time to break out this year’s Ugly Sweater candidates! By the way, the ugly sweater you see me wearing in that article was created using the “make your own ugly sweater” link at the bottom of that article. Hence, the sweater doesn’t actually exist. Unfortunately, that link isn’t working any longer either. 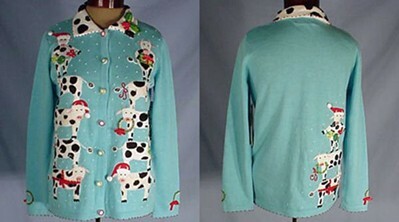 So that sweater is truly a classic… a one-of-a-kind heirloom. But this one is a close runner-up. 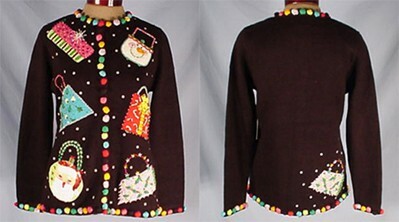 Perhaps the following Ugly Sweater ideas will be helpful when you’re searching for your very own Ugly Sweater to wear to parties this year. Yep, Ugly Sweater season is upon us. If you haven’t decided which are your ugliest sweaters for this holiday season yet, or you just can find the “right” one… consider the sweaters below. They’re all available online. 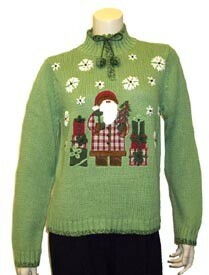 I realize that buying an Ugly Sweater — on purpose — is not exactly the point to this seasonal tradition. 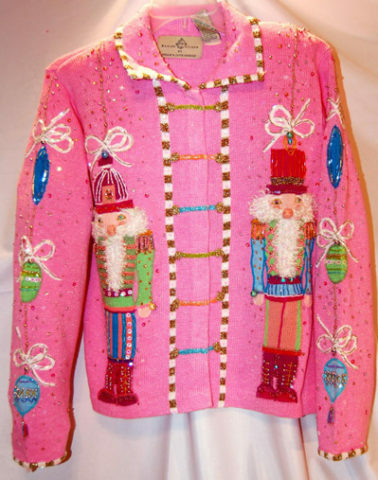 After all, Ugly Sweater contests were founded on the idea that everyone has at least one outrageously grotesque garment in their closet — not necessarily by choice. 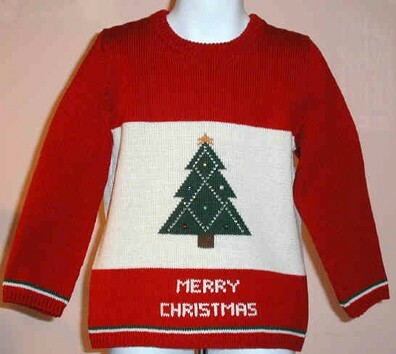 More than likely, that Ugly Sweater was purchased just for you… Or, quite possibly, handed down to you. But hey, if you haven’t been graced with an Ugly Sweater (naturally) yet, then you just might be interested in buying a really fun one for this year’s festivities. Right? That, or you might be interested in starting the tradition among your own friends & family by buying someone else a really Ugly Sweater. Click pictures for ordering info. This one’s hot, HOT, pink… and loud. 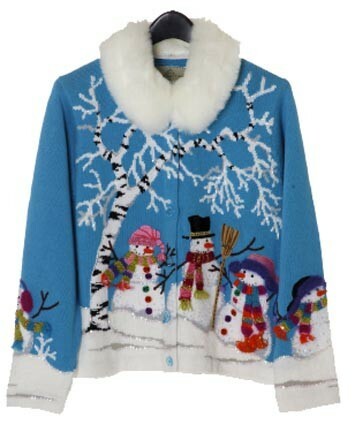 A sweater with tumbling snowmen just wreaks of fun, right? A classic… this one just makes you smile — really big. Be careful not to brush up against anything… you’re sure to lose a ball! The faux fur & wintery effects are nice… but they make me want to put on a sweater! This one gives me the warm fuzzies… just like a pair of old stockings! Well… some of those were interesting alright. And in just the right circumstances, many of the above sweaters could probably be considered “classy”. Just the same… if you were to wear any of them to an Ugly Sweater party, you would certainly fit right in. Haven’t Found The Perfect Ugly Sweater Yet? 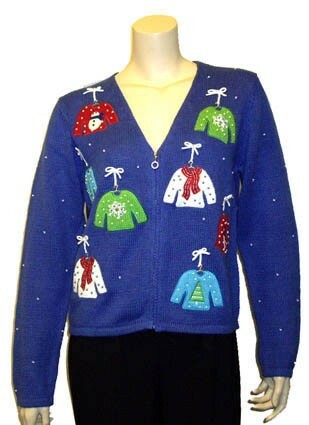 And just for the guys… here are some Ugly Sweater ideas for men! 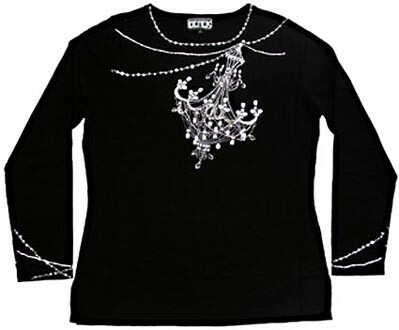 Not quite bold enough to wear an Ugly Sweater to the party? 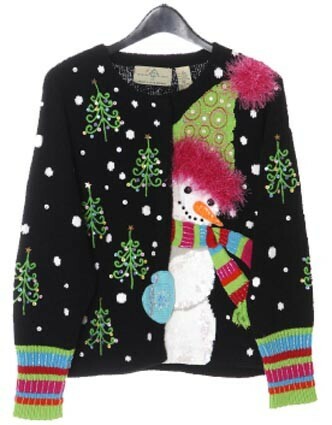 You could always just take an Ugly Sweater “prop” instead!